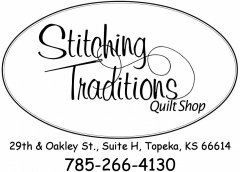 Stitching Traditions Quilt shop has been serving our friends and neighbors in the Topeka, Kansas area for more than 16 years. With over 2,000 square feet of designer fabrics, books, notions and more, our knowledgeable staff can help you find what you need. Between fun sewing classes and clubs and our shop dog Winnie, Stitching Traditions Quilt Shop has become a favorite meeting place for area quilters. Stop by today and see for yourself.